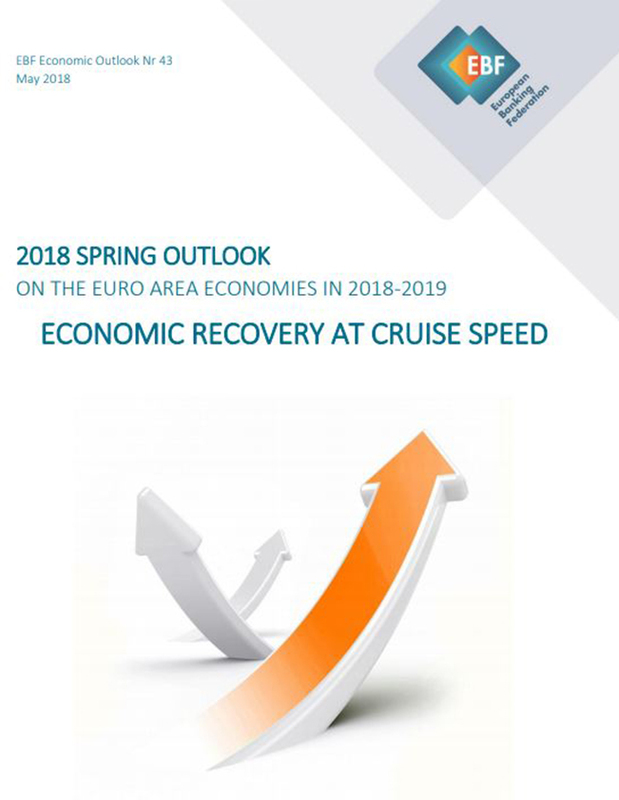 The projections presented in this chapter have been compiled from the EBF Spring 2018 Economic Outlook, a bi-annual report prepared by the European Banking Federation’s Chief Economists’ Group. European Commission data for previous years. Supported by the European Central Bank’s (ECB) accommodative monetary policy stance, a strong global economy and robust domestic demand, and despite political uncertainty and geopolitical tensions surrounding the world economy, the euro area grew by 2.4% in 2017. This was a higher rate than international partners such as Japan (1.7%) and the UK (1.8%) and comparable to the US (2.3%), but lower than Canada (3%) and China (6.9%). In 2018, the 19-country bloc will continue to benefit from supportive financial conditions, sustained global and domestic demand, and robust growth of global economy. While political uncertainty in Europe is less of a threat than in previous years, geopolitical tensions and the possible escalation of trade conflict remain downside risks. The euro area is expected to expand, above potential, by 2.4% in 2018. The growth is expected to slacken slightly in 2019, when GDP expansion of 2.1% is forecast. The Euro area however has a lower expected growth rate for 2018 and 2019 than the EU 28 and the US. Domestic demand will remain the key driver for the expansion of the euro area economy, as it has been over the last few years, running on the two engines of private consumption and investment, and sustained by job creation, slow return of inflation and improved profitability. Private consumption will maintain a healthy growth in 2018 benefitting from an improved labour market and favourable financing conditions. Fixed business investment will continue its recovery benefitting also from favourable financing conditions, after a period of significant decrease mainly due to a wide range of uncertainties and lower bank lending in a number of countries. On the back of a sustained global recovery, world trade continued growing in 2017 boosting European exports by 5.1%. The global economy will continue, in 2018, to expand supporting external demand and boosting European exports despite the euro appreciation. Exports are expected to grow by 4.9% outpacing a 4.5% growth in imports. Since the peak of the financial crisis, euro area member states have achieved significant progress in reducing public sector deficits. The fiscal policy stance is expected to remain broadly neutral over the forecast horizon. With the decrease of the deficit ratio, mainly due to the low interest rate environment and the economic upswing, the euro area fiscal deficit is to equal 0.9% of GDP in 2018. This, in combination with the economic recovery, will translate into a reduction of the debt to GDP ratio over the forecast horizon. At the beginning of 2017, consumer prices increased at their fastest pace since 2013, driven by a surge in commodity prices. However, since then, the development has softened somewhat and with still significant slack in the labour market limiting upward pressures on wages and prices, gains in the forecast horizon will be modest. The overall rate of inflation is expected to remain stable with consumer prices increasing by 1.5% annually over the coming years after increasing by 0.2% in 2016. Core inflation (excluding volatile items like commodities, energy and non-processed food) will increase in 2018 at a lower rate than overall inflation, 1.2%, due to weak labour market dynamics i.e. wage growth and lower import prices. Labour market conditions remained favourable in 2017 stimulated by a combination of robust domestic demand, a relatively low increase in productivity growth and structural reforms, e.g. labour market reforms undertaken in some euro area countries. These labour market conditions are expected to remain favourable in 2018 driven by the economic upturn. With economic growth above potential, unemployment has been improving and is expected to continue this trend over the coming years. Unemployment in the euro area is expected to be 8.4% in 2018, with a further improvement to 7.9% in 2019, the lowest levels since 2008. Solid growth of the world economy will permit the euro area to continue growing above potential making the 19-country bloc more resilient to external shocks. However, although the uncertainty related to the political events in Europe has diminished, geopolitical tensions have the potential to spark a period of instability disturbing buoyant global growth. Trade tensions could also trigger a trade battle that would harm the recovery of the global economy. The euro area, which is relatively highly exposed to external trade, would be severely hit by a trade war following the tariffs imposed by the US administration on European steel and aluminium exports. The Chief Economists’ Group of the European Banking Federation in its Spring 2018 Outlook of the Euro Area Economies in 2018-2019 argues that the current economic outlook remains surrounded by a number of upside and downside risks with the risks to the growth outlook fairly well balanced.